Christmas has been good to me (although arguably less good to my liver) and my tasting cupboard is overflowing. Among my overflow is a nice collection of miniatures, of which this is one. 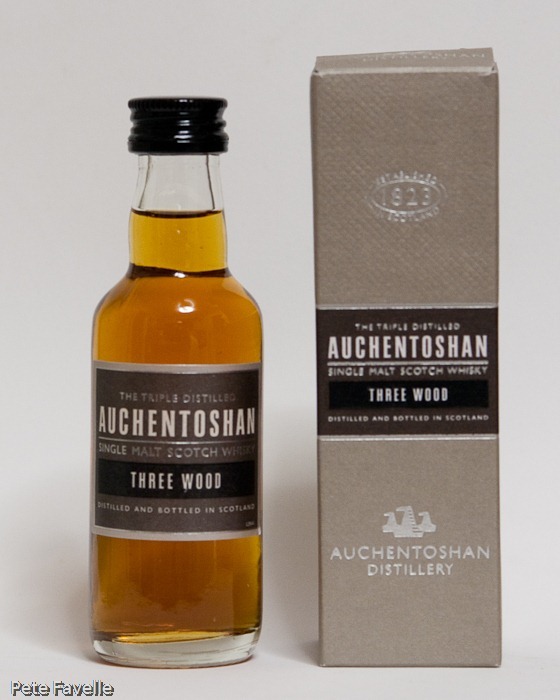 The Auchentoshan Three Wood is a Lowland whisky which as been matured in three different casks – starting life as most whiskies do in American Bourbon, moving on to Spanish Oloroso Sherry before being finished off in Pedro Ximenex Sherry; thus, the Three Wood name. It has no age statement, so all we really know about it is that it’s taken at least three years to make that journey – the legal minimum to be called whisky. Those sherry casks give the whisky a deep, rich bronze colouring in the glass and it has some positively syrupy looking legs on it. The nose has some smoke to it, hints of the oak and the rich sweet fruitiness of that sherry – there’s an almost fruitcake-like character to it. With water the fruit is cut back somewhat, leaving you with a more caramel kind of sweetness. The taste has a big punch of fruitiness at the start which slowly leads into the warming alcohol burn that lingers far longer than the 43% strength would suggest. There’s a significant tannic aspect to the tail as well. 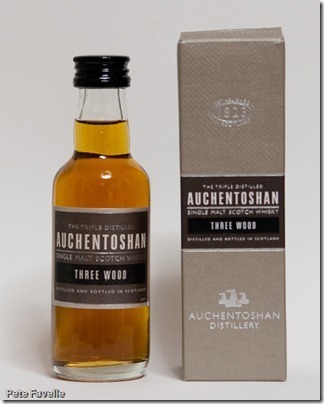 Again, water pushes the fruit back a little, allowing other notes to come to the fore – wood again, and some burnt sugar sweetness, perhaps just a waft of black treacle. The dry, tannic finish is still there in spades. Overall, a pretty tasty dram. Smooth and sweet, with some nice complexity to it. I’ll certainly add the distillery to my ‘try the rest of their range’ list.